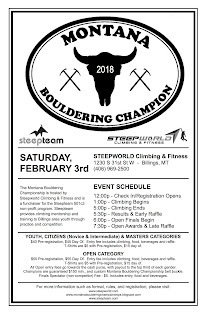 Steepteam is a 501c3 non-profit dedicated to providing climbing mentorship and training to Billings area youth interested in improving their climbing skills through practice and competition. Our focus is to develop lifelong climbers. Local competitions will be required as we feel that they provide great benchmarking and goal setting opportunities in a friendly environment while helping foster the greater Montana climbing community. We are not requiring team members to participate in USA Climbing sanctioned events. Climbers wishing to compete at a USAC level will still have continued support by the team and coaches. Starting Tuesday, March 5th, through May 30th, practices will be twice a week, Tuesdays and Thursdays, at STEEPWORLD Climbing& Fitness, with breaks for the holidays. *Payment can be made online at www.steepteam.com, or in person via cash or check on the 28th. All team members are required to have their own gear, this includes shoes, harness, chalk bag, and appropriate climbing attire. Rental shoes greatly hinder the development of good footwork and are not acceptable. Fees cover coaches time and travel for 26 practices, competitions, insurance, administration, and other necessities needed to run the Steepteam non-profit program. Steepteam practices at Steepworld Climbing & Fitness in Billings Montana. Gym membership is a prerequisite to being on the team. Gym fees are separate from team fees. and cover the costs for routesetters to set and prepare for the comp as well as t-shirts, awards, gym time, etc. Steepteam is offering a limited number of scholarships this season. For more information, talk to Steepteam Board Director, Jim Rott, by email at jim@steepworld.com. Starting Tuesday, October 2nd, practices will be twice a week, Tuesdays and Thursdays, at Steepworld/Steepworld Climbing & Fitness, with breaks for the holidays. *Payment can be made online at www.steepworld.com or in person via cash or check on the 27th. All team members are required to have their own gear, this includes shoes, chalk bag, and appropriate climbing attire. Rental shoes greatly hinder the development of good footwork and are not acceptable. Fees cover coaches time and travel for 30 practices, competitions, team shirt, insurance, administration, and other necessities needed to run the Steepteam non-profit program. Steepteam practices at Steepworld Climbing & Fitness in Billings Montana. Gym membership is a prerequisite to being on the team. This is a separate fee from team fees. Climbing competitions have entry fees around $40-$50 per competition. These prices are set by the host gym. New to climbing? This is the team for you! The Rec. Team will focus on movement and technical development while keeping things fun and light hearted for 1st year climbers. For more information regarding cost, dates, etc. please contact STEEPWORLD Climbing & Fitness at (406) 969-2500 or at www.steepworld.com. The Competitive Team is all about providing an advanced program to support climbers who have a desire to compete and push themselves in a competitive environment. It is for all ages and abilities. Climbers are expected to show discipline, drive and a passion for climbing and advancing their abilities. The team roster will be evaluated on a monthly basis. Practices will be select Saturdays from 10:00am-11:30am. For more information such as dates, cost and further expectations, please contact Dillon Key. About: This trip will include two evening bouldering sessions in Billings, one at Phipps Park and another at the Water Tower Boulders, and then a full day of bouldering on Cedar Mountain in Cody, WY. Climbers will learn about proper pad placement, safe spotting techniques, and problem solving. About: This trip will include one evening at Steepworld to review and practice rope skills, another evening on the Rims above Gregory Hills to practice and refine rope skills on real rock, and then a full day of climbing in Piney Creek Canyon, just outside of Story, WY. Climbers will learn how to belay, tie-in using a figure-8 knot, and effective communication necessary for safety. To register for any of the Summer Session Climbing Trips, please contact Dillon Key by phone at (281) 450-2422, or by email at steepteamcoach@gmail.com. Please pay attention to the registration deadlines specific to each trip. Every trip caps off at a maximum of 12 climbers. Payment in full is due prior to the registration deadline specific to each trip in order to guarantee a spot. Payment can be made via cash, a check made out to ‘Steepteam’, or online at www.steepteam.com. Don't forget your waiver! Waivers expire every year, please update prior to the comp. if necessary. Fill out an online waiver HERE. One round Redpoint style, top 3 completed routes scored. Scoring and point values will be determined using the USA Climbing web based scoring system. USAClimbing Memberships can be paid for online HERE. If you are not renewing an annual membership, please purchase a Day-Member Pass for $10, no earlier than the Monday prior to the event. Please do not purchase the Day-Member Pass before Monday, April 2nd, 2018. If you do, the pass will no longer be valid the day of the event and you will have to purchase another Day-Member Pass on or after Monday, April 2nd, 2018. Visit http://www.usaclimbing.org/Members/Membership_Overview.htm for more info on Day Passes. We ask that all Steepteam climbers arrive no later than 9:30am. If you have any questions, please text or call Dillon Key at (281) 450-2422. 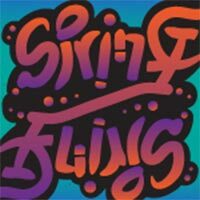 Starting Thursday, March 1st, through May 31st, practices will be twice a week, Tuesdays and Thursdays, at STEEPWORLD Climbing& Fitness, with breaks for the holidays. *Payment can be made online at www.steepteam.com, or in person via cash or check on the 27th. We will hold 4 practices outdoors (weather permitting). Tentative dates will be handed out at Sign Ups. Climbing competitions have entry fees around $40-$50 per competition. These prices are set by the host gym and cover the costs for routesetters to set and prepare for the comp as well as t-shirts, awards, gym time, etc. 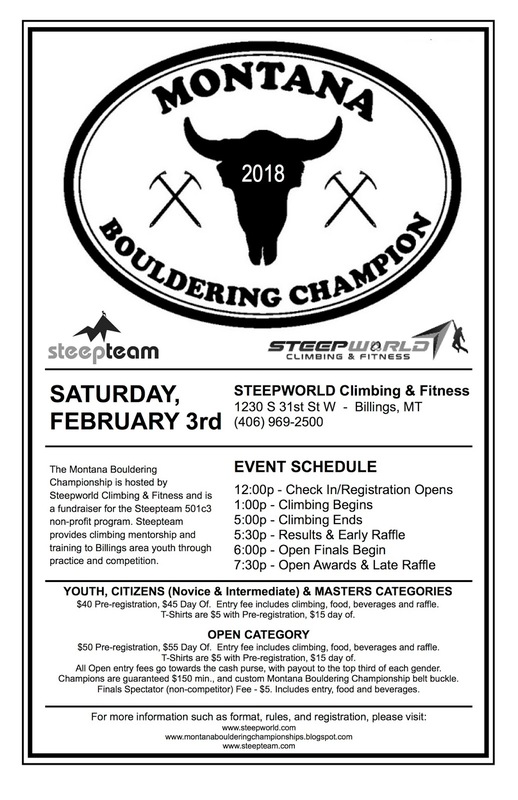 The Montana Bouldering Championship is hosted by SteepWorld Climbing & Fitness and is a fundraiser for the Steepteam 501c3 non-profit program. Steepteam provides climbing mentorship and training to Billings area youth through practice and competition. 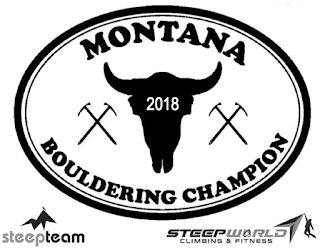 The Championships provide a competition venue that promotes and rewards the upper talent of Montana Bouldering while providing a fun and entertaining event for recreational climbers. Pre-registration information will be available within the next few weeks. Registration can also be taken care of the day of the competition. $40 Pre-Registration or $45 Day Of. Entry fee includes climbing & beverages. $5 Adult Spectator Beverage fee. This gets the spectator entry & beer. Youth competitors compete within their respected USA Climbing age category. Category winners awarded with medals. High value prizes will be raffled off among all Youth, Citizen, and Masters competitors. $50 Pre-registration or $55 Day Of. All open registration fees go towards the cash purse. 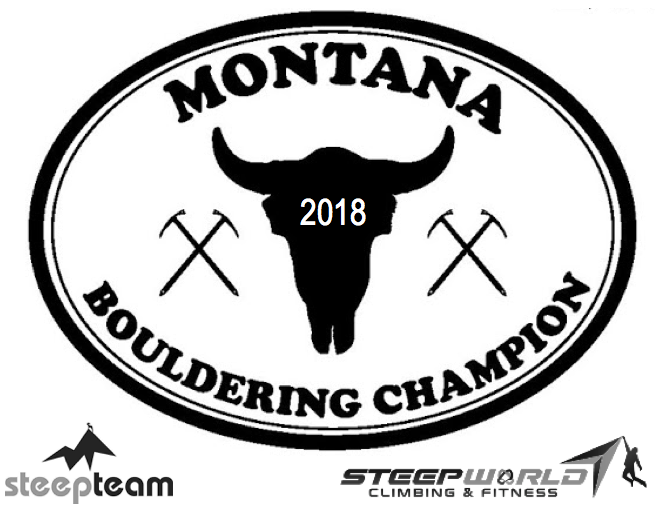 Guaranteed $150 minimum to winners (men & women) and custom Montana Bouldering Champion Belt Buckle. Open redpoint format consisting of more than 70 routes of evenly distributed difficulty. 4 hours of climbing time. Each route is given points based on its difficulty. A climber’s total score equals the top 5 scoring routes. The top 6 in the Open Category of each gender will move onto finals. Competitor scores will zero out for finals. Ties will be split by qualifier scores. Finals will be a timed onsight format, competitors remain in isolation until their turn to climb. There will be 2 finals routes. Each climber will get 3:00 minutes of climbing time per route. The 3:00 minutes is a hard time stop, meaning climbers will not be allowed to continue climbing the route after 3:00 minutes. Finals will be scored in accordance to the USAClimbing Onsight Format. Problems will consist of a START, ZONES (5, 10 & 15 point) and TOP (25 points). A tenth of a point will be deducted for every fall a competitor records in order to achieve their highest score. A competitor’s finals score equals the combined total from the two finals routes. The finals score determines final placement. Cash payout to the top 5 of the field in each gender. The Billings Climbing Team is a 501c3 non-profit dedicated to providing climbing mentorship and training to Billings area youth interested in improving their climbing skills through practice and competition. More info HERE.